Are you one of the 2 in a 100? 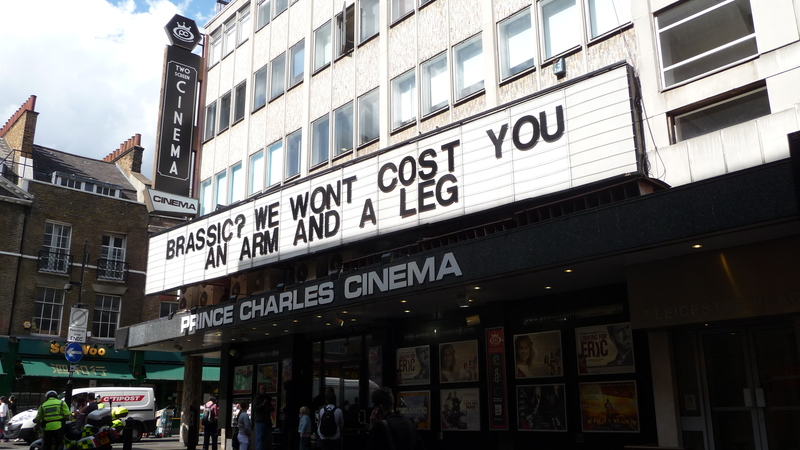 London's Prince Charles cinema – home to the 'Indie Mainly' crowd? The UK film market has a new audience research model to contend with. Film3Sixty spent six months interviewing 18,831 people across the UK and digesting the results according to a report by Wendy Mitchell in Screen International, 27 January 2012. Their conclusion was that nearly 90% of film watchers think that cinemas are the best places to watch films – but that they think that cinemagoing is getting more expensive. The conclusion is that this reflects unease with 3D pricing but presumably it also reflects the impact of the recession. The report summary makes for interesting reading. The sample was drawn from the most frequent cinemagoers – the 40% of the audience who account for 80% of admissions. The sample overall watched an average of just over 120 films per year of which just over 17 were in the cinema (the per capita figure for UK cinema visits is under 3). Two-thirds of the films watched outside cinemas were ‘not paid for’ – mostly on TV but sometimes via pirated copies. The research did however confirm the often quoted observation that those who admit to piracy are also the heaviest cinemagoers. This breakdown can be compared to the ‘qualitative study’ of ‘avids’ for the UK Film Council, downloadable here. This was part of the UKFC approach which divided audiences into four groups – Mainstream, Mainstream Plus, Aficionados and Avids. The two sets of categories are actually quite similar, but this new research offers more detailed data. In both cases the categories run from the occasional interest in tentpole pictures through more diverse tastes to a rejection of Hollywood and an ‘obsession’ with specialised films (the avids). What’s quite interesting is that the new figures – based on a survey of the most frequent cinemagoers – demonstrate the commercial importance of diversity. We can see this in two ways. The majority may prefer blockbusters, but 31% actually opt mainly for ‘independent films’ – whatever that might mean. On the other hand, we can say that a bigger majority of 88% are interested in at least a range of films (i.e. not just blockbusters). This seems to send a different message than the usual assumption that the audience for more specialised films is only a tiny percentage of the whole. The survey further tells us that the ‘Blockbuster‘ groups are more likely to be female (53-56%) and younger. The blockbusters they like are comedies and rom-coms. They are also more likely to watch TV, own games consoles, buy the most home entertainment products but also to pirate movies. It’s ironic that these audiences who prefer big budget films are less likely to see them in cinemas – these are the lightest cinema attenders. The heaviest cinema users are the ‘Indie Mainly‘ group who are 52% male with an average age of 44.5 years. They are also the most likely to buy DVDs, to stream films online and watch them on computers. They are also the heaviest Twitter users (whereas the Blockbuster groups are the heaviest Facebook and YouTube users). The report suggests that social media use is an area the film exhibition industry needs to think about much more – quoting a respondent who has 43 Facebook friends who he frequently persuaded to make cinema visits. A stand-out observation is that those who are influenced by social media are likely to make up to five times as many cinema visits as the average cinemagoer. Some people clearly take the ‘like’ button seriously. So what of the 2%? We (certainly me – the others can speak for themselves) are most likely to be male (55%), aged over 54, least likely to pirate but also least likely to ‘consume’ DVDs. We prefer drama and foreign language titles and we are the lightest users of Facebook. Apart from the DVDs that sounds like me! On the whole this looks like a pretty useful breakdown of the audience in terms of frequent cinema users. I do recommend the UKFC Research as well. The discussion of avids is fascinating and it’s interesting that the research did try to look quite carefully at the very frequent cinemagoers – many of whom work in the film industry or in film education (although quite a lot of the film teachers I meet seem to go to the cinema only occasionally). The real avids see two movies a week at the cinema – a figure I would struggle to achieve without the boost of festival screenings. Such dedication is of course only possible for avids if they live somewhere with a diverse range of films available in several cinemas rather than just a single multiplex with only Hollywood on offer.